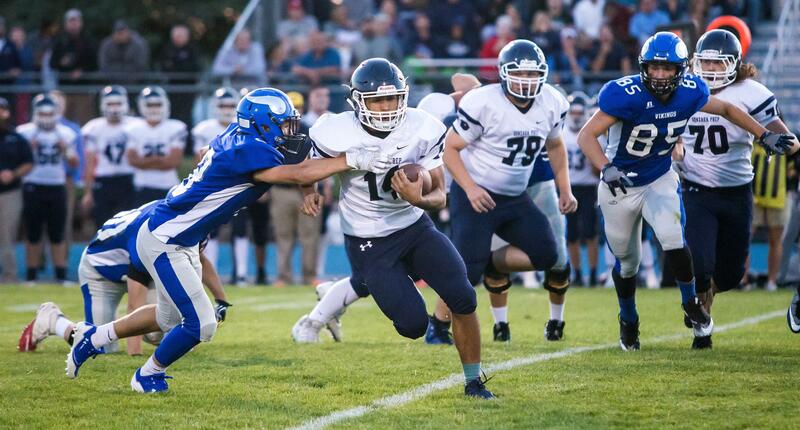 UPDATED: Sat., Sept. 8, 2018, 10:50 p.m.
Zane Melzer ran for 157 yards on 24 carries with two touchdowns and Gonzaga Prep (1-1) beat visiting St. Ignatius (0-3) 44-30 on Saturday. Connor Halonen added another 20 carries for 147 yards with a touchdown on the ground. The Bullpups gained 480 yards total offense. St. Ignatius hung around until halftime, but Gonzaga Prep ripped off 14 unanswered points in the third quarter, distancing themselves from the visitors. The Wildcats did strike first with Mark Biggins diving in from a yard out. Biggins finished with 157 yards on 25 carries and two touchdowns. But Prep responded with a score of its own as Melzer scored after a 15-yard scamper. During the second quarter, the Bullpups added 17 points on the board without allowing a point. A Halonen 31-yard touchdown pass to Eric Floyd and a Daniel Siwinski interception return for a touchdown extended the Bullpups’ lead. Halonen had a slow, yet efficient night passing the ball, attempting only eight passes while completing four of them for 87 yards and a touchdown. The Bullpup defense gave up some yards in the game, allowing the Wildcats to rack up 383 yards of total offense. Previously, St. Ignatius, of San Francisco, scored only 14 and 21 points in its first two games against fellow California schools. Prep did force two turnovers, the aforementioned interception and a Matt Holden fumble recovery. Kamau Pasadaba added a rushing touchdown in the third quarter for Prep. The Bullpups play at University on Friday at 7 p.m. in the first Greater Spokane League game of the season for both teams. In the other GSL game, Central Valley handled Garfield 39-28. The Bears host Lewis and Clark, also on Friday at 7 p.m. Published: Sept. 8, 2018, 10:14 p.m. Updated: Sept. 8, 2018, 10:50 p.m.